The 100 5×05, “Shifting Sands,” was all about the words, spoken and unspoken, between friends and strangers. Here is our review. At this point, it doesn’t seem like a stretch to call season 5 the best season yet. Each episode builds on the momentum of the last, and while it is clear that certain characters are being prioritized over others (and really, that’s how it has to work with such a big cast of fleshed-out, interesting characters), each episode has managed to deliver on the emotional ties that count for the story they’re setting up. The fifth episode of season 5, incidentally, had a lot of similarities to the fifth episode of season 4, “The Tinder Box,” in which two armies were similarly at an impasse, on the edge of a conflict so easily avoidable if its leaders would just stop and listen to reason for one second. The game has changed, however, and the players have moved positions. If “The Tinder Box” was like a game of chess, “Shifting Sands” is like The Settlers, or Risk, or that actual board game called Shifting Sands. A big, complicated strategic minefield with penalties and team bonuses and getting really drunk. This episode is staff writer Nick Bragg’s first (and sadly only) The 100 episode, and what a debut. I’m kind of annoyed by how good it is, since Bragg, like most of the current writing staff, is not returning next season. There is a lot to love about “Shifting Sands,” but the one thing I particularly enjoyed was the dialogue. Not just because it so succinctly expressed all of those intertwining character tensions, but because of how refreshingly straightforward it was, even while communicating so much more than the actual words spoken. Everything in this episode is a negotiation. Everything is a strategic manoeuvre. Everyone stands to gain or lose something from their interactions with the other character(s) in a scene. Bellamy and Clarke. Emori and Murphy. Raven and Murphy. Raven and Zeke*. Diyoza and McCreary. Diyoza and Kane. Abby and Kane. Abby and McCreary. Octavia and Indra. Octavia and Bellamy. All of these dynamics matter so immensely, and because they matter, everything that happens in this episode — every decision made, every line drawn or crossed — feels so much bigger and more significant. And that is why this season works. Because the action matters. Because the characters’ decisions matter. Because the characters matter to each other. Because the tension of who these people were versus who they have become makes their relationships to each other more meaningful, not less. 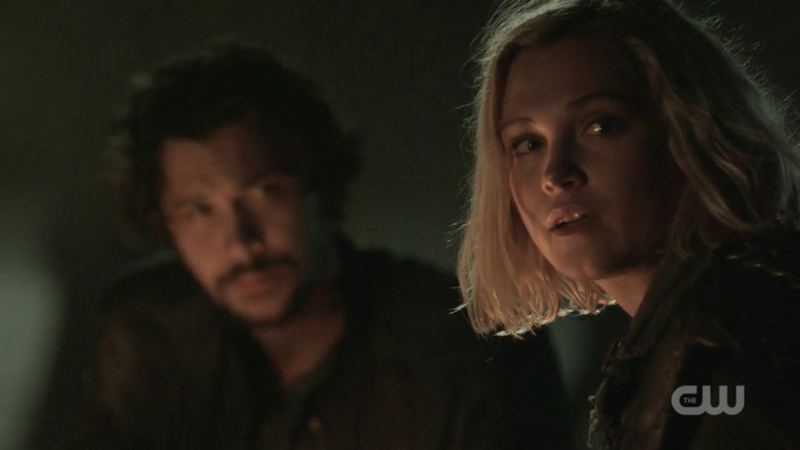 Just look at Clarke and Bellamy. That relationship has always been big, heavy, significant. The ‘head and the heart’ metaphor is one that has been made extra-textually since season 1. Yet the vocalizing of it, the myth-making that the time jump has allowed for, makes it so much more — for lack of a better word — epic. These people, all of these people, are giants in each other’s hearts and minds, and so they become to us, the audience. And then there is the myth-making around Blodreina, and the threat that Bellamy poses to her absolutist rule. He humanizes her, and questions her, and undermines her. He unravels the legend to uncover the girl beneath (under the floor), and that makes him dangerous. Bellamy and Octavia are siblings; Blodreina and this man who fell from space are strangers. And all of this tension, all of these war games and negotiations and shifting allegiances and tactical movements, are about love. Love of a person, love of a people, love of an idea, love of a place. This episode might on the surface be about strategy, but every single thing that happens in this episode is because of love — or the absence of it. …Except the worms. I’m not going to find symbolism in the worms. I REFUSE TO– oops, too late, I got something. The ground is punishing the Grounders for what they have become inside that bunker. Irony at its finest (and most disgusting). As harrowing as it is to watch Octavia lead her people down this dark path, consumed by the cult of herself, I really have to applaud the series for taking her to this extreme. She has always been one of those characters that divided the fandom, and who has been hard to analyze, because her actions and evolution could be interpreted in so many ways depending on where you thought her story was headed. I don’t necessarily think this evolution was always the plan for her — but it was always possible. All the way from her isolated, disturbing childhood through finding freedom and independence in violence, to being completely shattered because she loved with abandon and lost that love in such a traumatizing, sudden way, Blodreina has always been simmering just beneath the surface, waiting. Watching her live up to this potential is as horrible and rewarding as watching Willow on Buffy finally be consumed by dark magic after five seasons of subtle build-up that was never guaranteed to come to a head. Unlike Willow, I’m not sure we should expect as clean of a comeback story for Octavia, but that’s okay. Sometimes people are just broken. And The 100 is more raw and authentic for refusing to fix everyone. But it should be clear from this episode that Octavia is as much of an addict as Abby, and darkness is her drug. And in some ways she is even worse off, because unlike Abby, she does not even let herself have a Kane. Poor Bellamy, certainly, can do nothing to fix her. Just as Kane could do nothing to fix her, and Indra can do nothing to fix her. Love cannot reach Blodreina now. For Blodreina, love is weakness, and war is all there is. She has found that clarity and release she sought so desperately in season 4; death feeds her, maybe in more ways than one. But for all that, Octavia continues to shimmer briefly back into focus. When Kane spoke to her, Octavia heard him. 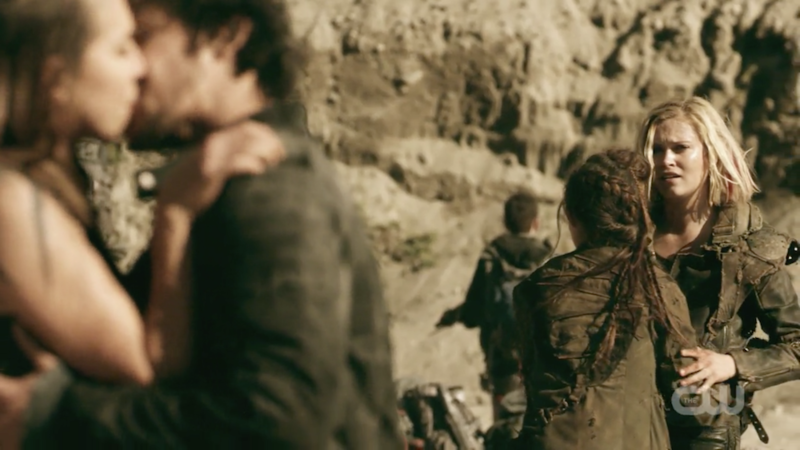 When Bellamy opened the bunker, Octavia hugged him. When Monty waved to her, Octavia waved back. Will there come a breaking point, when Octavia can no longer be contained? Or will there come a different kind of breaking point, where we lose Octavia forever, and only Blodreina remains? Or have we in fact already lost her, and whatever is left is just a shadow? I don’t know. I don’t know where her story is going, just as I have never known where Octavia’s story is going, and that is what makes it so exciting. She is not a hero, even if she does heroic things. She is not a villain, even when she acts like one. She has always been the wild card, and she raises the stakes of the narrative just by existing. I feel like various characters’ reactions to Octavia is a pretty good barometer for how many different interpretations of her actions there can be. Clarke’s response to her is particularly fascinating, and shows not only how much Octavia has changed, but how much Clarke has. This is a Clarke who has matured, softened in some ways, hardened in others, and who has learned to fully rely on her powers of observation. Clarke’s instinct has always been to take charge of every situation, so it’s interesting to see a version of her who doesn’t. Who clearly knows what to do, and has a confidence and competence that none of the other characters have, but who also knows how to pick her battles, and to reserve judgement. Unlike Bellamy, who is obviously very emotionally compromised by what Octavia has become, Clarke is able to take a step back and admire what Octavia has accomplished, as one leader to another. That shows growth. 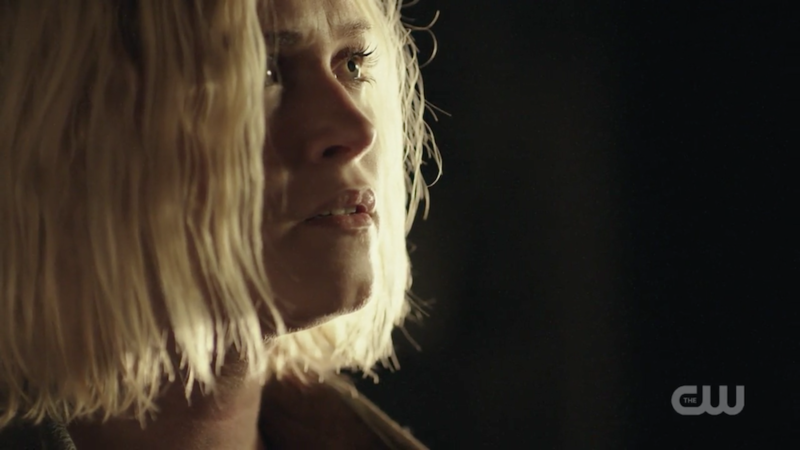 While Bellamy’s newfound ability to balance head and heart is more obvious (partly because is has actually been made textual), I think Clarke’s is just as profound. 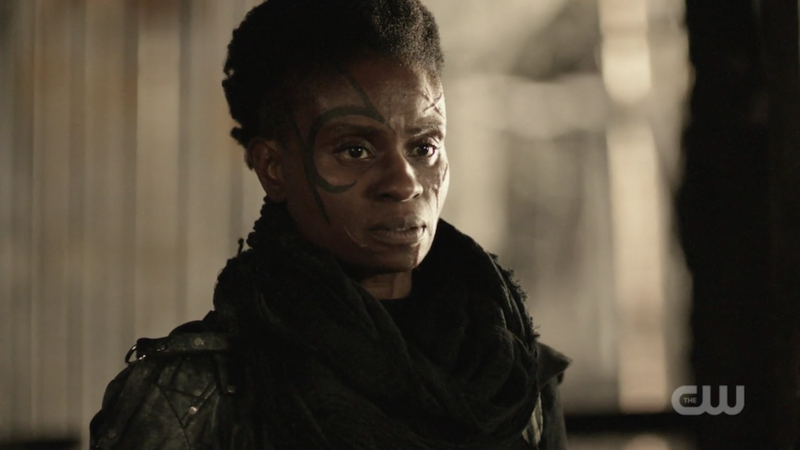 Indra continues to be the absolute standout character of the season for me, and it is wonderful to see how she has evolved, not just in the bunker but over the course of the whole series. When we meet her post-time jump, Indra remains the only person not brainwashed by Wonkru’s cult, which speaks both to the strength of her convictions and her common sense. 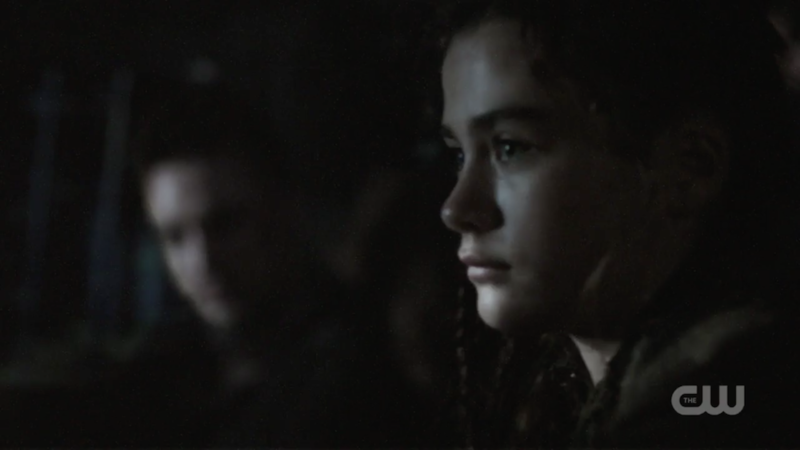 Her loyalty, now and always, is to Octavia, not Blodreina, and one of the things that gives me a (faint) hope that Octavia is not completely lost to the darkness is that Indra clearly sees something in her still that makes her keep fighting for her soul. “Your brother loves you”; “I love you.” Love is the key. Indra understands this; maybe she has always understood this (she loved Lexa, too, and Gaia broke her heart when she chose to leave), but something inside that bunker made her realize the importance of saying the word out loud. I would be a lot more worried about the glass in her lungs if I didn’t know we had that scene between her and Gaia in the trailer still coming, but I do wonder what her role will ultimately be in the rehabilitation/downfall of Octavia. Whatever happens though, I am convinced that love is ultimately what will snap Blodreina, one way or another. And I hope Indra is there to see it. Seeing Indra scoff at Cooper’s behavior is another reminder of how much the former has grown, because Cooper essentially is to Octavia what Indra was to Lexa in season 2. But Indra has grown and learned a lot since then, and fully understands the burden of leadership in a way that Cooper clearly does not. And then, somewhere in the middle of being a soldier and being a friend, there is Miller. Miller, who might be loyal to Blodreina, but who was, if grudgingly, willing to listen to Clarke’s reason, and who did not pull his gun on Bellamy. Hopefully we’ll get more of his perspective on this whole Wonkru situation as well, somewhere down the line. PS all of this happened just after Miller kissed! his! boyfriend! Jackson! goodbye!, so you have to appreciate the fact that I was able to pay attention to anything else for the rest of the episode. On some level, it feels a little underwhelming to just see them interacting like they haven’t just been separated for six years. But it isn’t exactly out of character for the two of them to slip back into easy companionship so quickly. Thrusting them into the midst on Wonkru has oddly made them feel like the other person is the only normal thing around them, even though obviously (especially for Bellamy) there is nothing normal about them being back together. And that they fall back in sync so quickly and easily is part of the beauty of this dynamic. They are so in awe of each other and how much they have changed as individuals, yet their connection and partnership is still second nature to them. It doesn’t take more than a few days for those six years to melt away, and for them to pick up that head and heart conversation like it happened yesterday. It isn’t that they’ve forgotten those other people or those other lives, but for Bellamy and Clarke, these past few episodes have been like meeting up with an old friend and falling easily into conversation, feeling for a moment just like that last half decade hasn’t passed at all — until suddenly you remember your new life and the responsibilities that come with it, and reality comes crashing back. That is exactly what happens for Bellamy when Echo runs into his arms, and what Clarke is experiencing as she watches it happen. It is a wake-up call for both the characters and the viewers. In case you forgot, six years was a long time. Even if, for a moment, it felt like it had been no time at all. 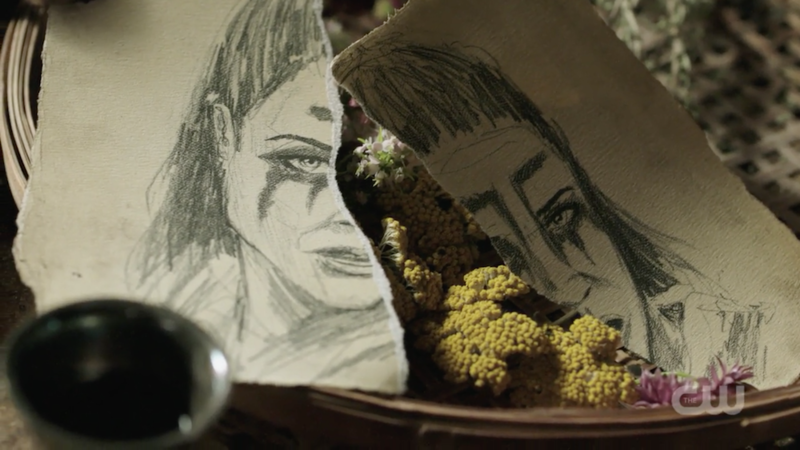 The structuring of these reunions is really smart, because it is much more emotionally impactful to have all the factions come together now than it would have been if Clarke had just reunited with SpaceKru all at once, or if Bellamy had found Wonkru first, or even if Abby and Kane had been there. 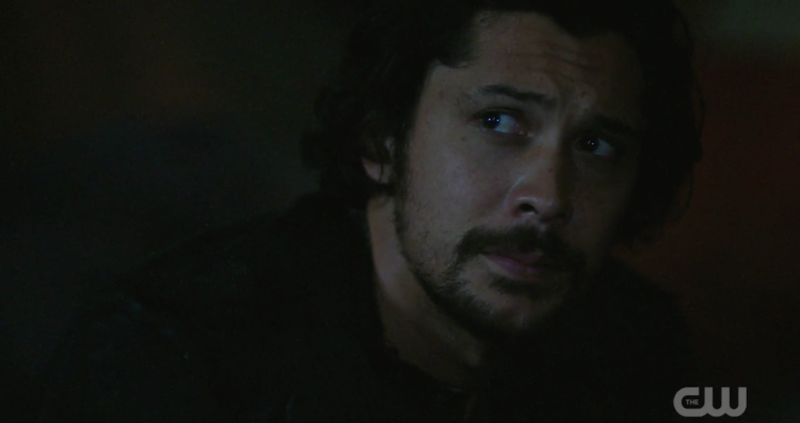 Letting Bellamy and Clarke get reacquainted in isolation from their new families (and essentially in isolation from Wonkru), and positioning them as natural allies against Octavia, has served to heighten the drama that will arise between their individual factions now that everyone is back together. Will Bellamy be able to keep palling around with Clarke now that his family is back and demands his attention? 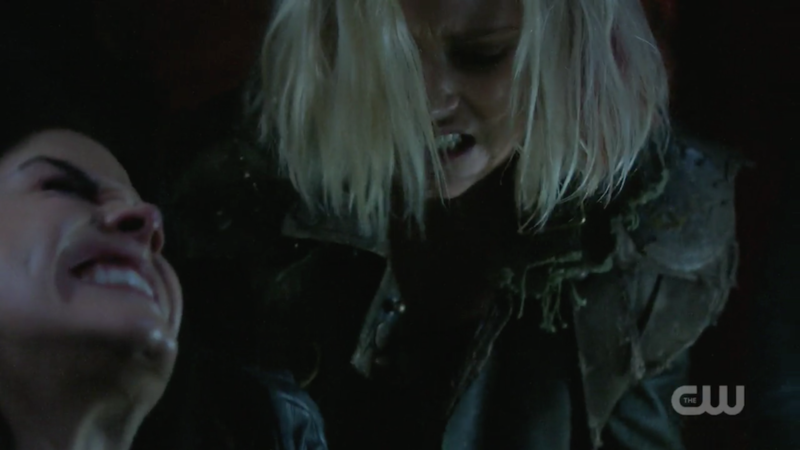 Will Clarke be able to stay cordial with Octavia, with Nightblood Madi in the mix? Will Octavia actively go after Echo, forcing Bellamy to become an enemy of Wonkru? What will Clarke do, if Octavia and Bellamy become enemies but Madi wants to stay with her ‘favorite’? Or what if Bellamy finds a way to ally with Octavia, but Octavia becomes a threat to Madi? And what happens when Charmaine Diyoza decides she is done trying to play nice? As I said in last week’s review, putting Kane and Abby with the Eligius faction was a genius story choice. 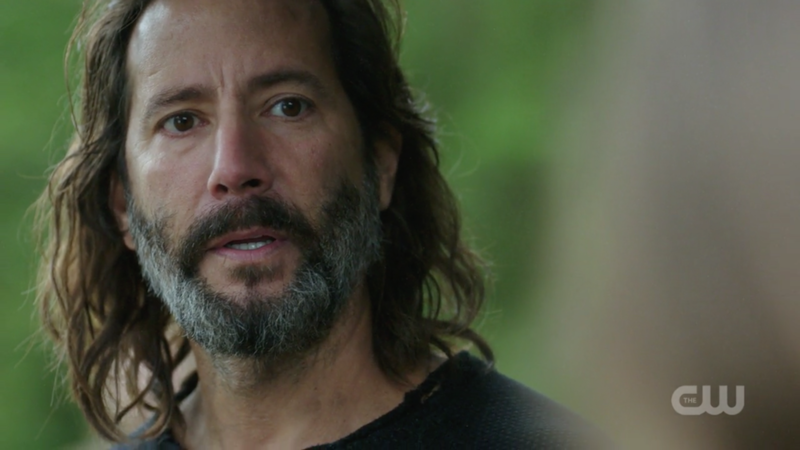 Kane and Diyoza’s dynamic is electric, and really allows both Ivana Milicevic and Henry Ian Cusick to shine as performers. I am just obsessed with Diyoza. She is far and away the best antagonist, if not the best new character, The 100 has ever introduced. In just a few episodes we get such a clear picture of who she is, and how fully realized of a person she is. Her backstory isn’t just shorthand motivation for her antagonistic actions as the ‘villain’ du jour. It really feels like she has lived an entire life before we ever meet her, like she is a crossover character from some other, amazing show that we never got to watch, arriving on screen like she already belongs here. And she listens to people. This trait is probably my #1 favorite trait in any fictional character — it is also why I like Kane so much. 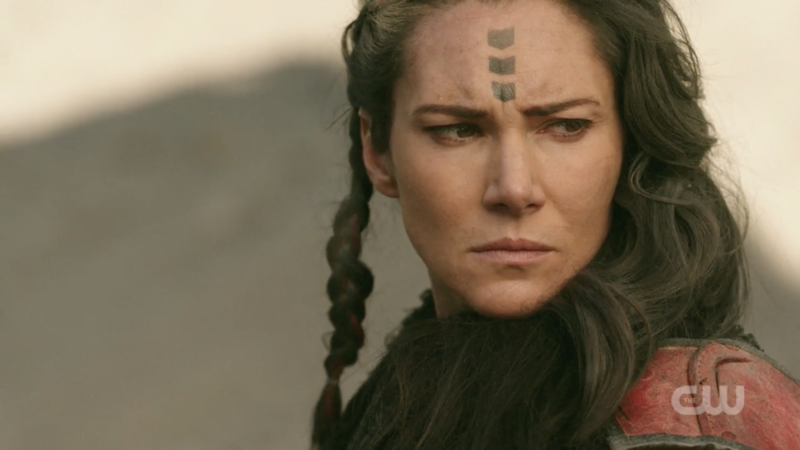 It is fascinating to watch Diyoza and Blodreina’s leadership styles contrasted in this episode, because while both are waging war, and both ultimately reign supreme over their people, Diyoza actually acknowledges that her people are more than sacks of meat, and — because of good sense, because of pride — she actually wants to make sure that the decisions she makes are the right ones. Usually she is one step ahead of her companions, but she can still acknowledge sensible arguments when she hears them. 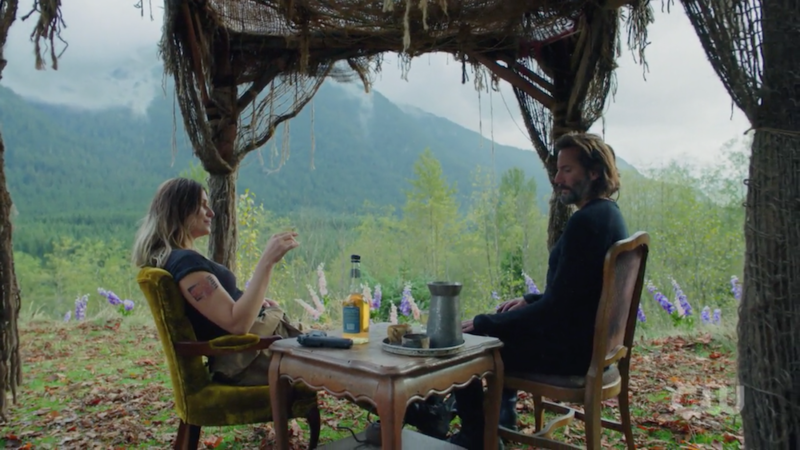 That is what makes her so exciting, and what charges her scenes with Kane so much (aside from their obvious chemistry — which is absolutely no threat to Kabby, because they are married in our hearts and that is final). Because it feels like Diyoza and Kane could actually change the world. Depending on how their tequila dates go, if Kane chooses the right words and the right arguments at the right time, he could genuinely influence her to do better. This might be the one leader he can get through to with words and logic alone. Or, equally likely, it could all come crashing down and end terribly. Diyoza has her own agenda. But at least Kane has a chance here. And it is all happening with words. To me, these battles are way more exciting than the physical ones, where brute strength and luck is what determines the outcome. As for Abby, she is fighting her own battle, with Diyoza predictably using her addiction as a way to control her. Just as love is not enough for Octavia, love is not enough for Abby either, with is heartbreaking, but very truthful to her experience. This is what addiction does to a person. Of course Abby loves Kane, desperately and completely, but that has nothing to do with her addiction. And Kane loves Abby equally desperately and completely, despite the illness that is clearly destroying her. Despite the fact that he can’t help her. If anything, it says a lot about how much Kane and Abby love each other that neither of them has emotionally pulled away from the other, regardless of how helpless they both feel. (If you want more commentary on this storyline, fellow Hypable writer Lelanie Seyffer has an amazing analysis that I encourage you to read as well). Abby and McCreary have a similarly (but very different) charged dynamic to that of Kane and Diyoza, and unlike with Diyoza, Abby actually has a semblance of the upper hand here. “Can you save me?” “Should I save you?” Ah. Magic. I have a feeling that this relationship will help give McCreary some nuance even while he remains a ‘pure’ villain. It goes without saying that William Miller is another incredible addition to the cast. His performance is so disarming, and I hate how much I enjoy him. Which is obviously exactly what they were going for, those bastards. When/if he does something terrible to characters I like (like Raven!) I am going to be so annoyed with myself. I already am. UGH. And speaking of ticking time bombs, we finally meet Mike Dopud’s Vinson — aka ‘the demon’. Like Miller, Dopud is just too good at being a bad guy, and I’m already dreading whatever terrible thing he is definitely going to do. But objectively, McCreary and Vinson are both incredibly interesting, unique characters in this world. 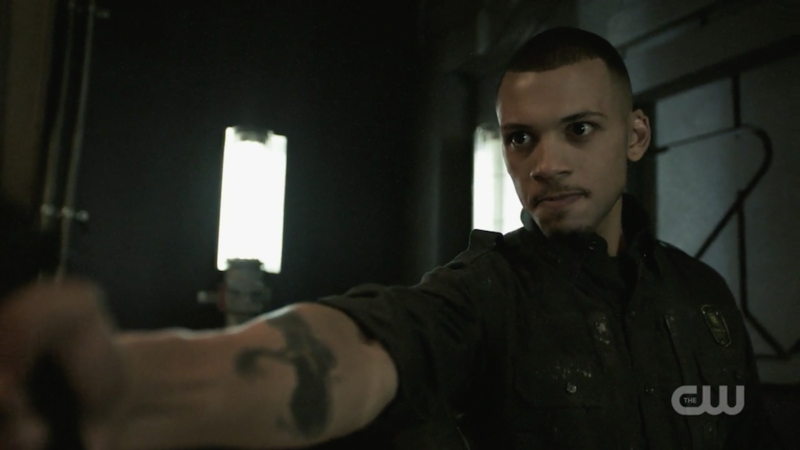 The 100 has never had someone so deliciously evil as McCreary, and it has never had such a soft psychopath as Vinson. A Hannibal Lecter of the post-apocalypse. tl;dr: I like it, but also, nopenopenopenopenope get them away from my faves. So this episode kind of put a temporary damper on my Zaven dreams, because while it is definitely happening, Miles Ezekiel Shaw is of course, like every other character on this show, complicated. Obviously we can consider him ‘good’ in the relative context of The 100, but Raven is right that he condemned her and Murphy to torture partially to save his own skin. And anything that leads to Raven getting tortured is awful. But we can’t exactly fault Zeke for wanting to stay alive. And he did also do it to save Wonkru — if he really wanted to save his own skin at all costs, he wouldn’t have done that. And he is working with Raven now, to minimize the damage. Basically, I am ~conflicted~. The unlikely trio of reluctant heroes are in a pickle, but Raven (obviously) has a plan. 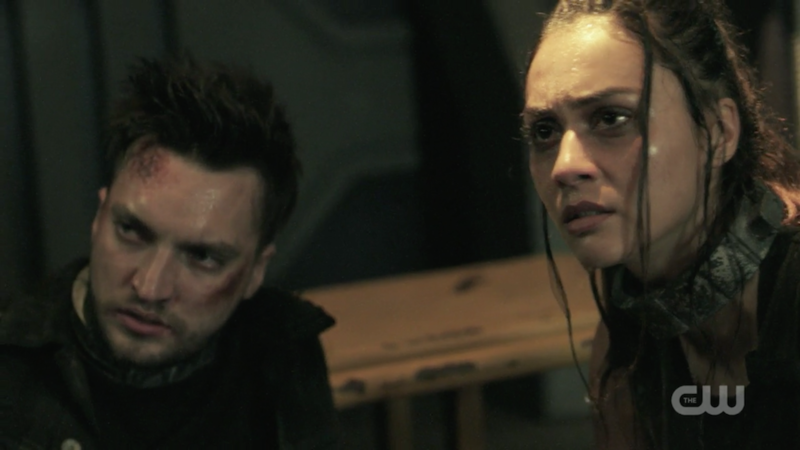 The plan involves letting Murphy go, in order to warn SpaceKru of the missiles (so they in turn can warn Wonkru). But does it also involve Murphy almost getting electrocuted to death, and his collar being used as a tracking device? If it does, Murphy doesn’t seem to know about it. It sure looks like Zeke double-crossed them. But nah. I suspect (or hope) that Zeke and Raven are in this together now, a pair of bright and compatible minds doing whatever they can to save as much of the human race as possible. And falling in love in the process. Murphy, meanwhile, has met Madi! And ohmygod. When is that spinoff happening? In an episode full of excellent scenes and character interactions, this was possibly my very favorite. Madi and Murphy are an instant sassy supersquad, and I love it. “I thought you’d be funnier.” Actual LOL. Of course they don’t get much time together, because Murphy has to leave the team behind again, another surprisingly selfless act for the good of the group. But he’s not alone. Because, surprise: Emori, for all that she is still very hurt and angry about their breakup, stays with him. If it wasn’t already obvious, all that hurt and vitriol that she spewed at him came out of deep love and heartbreak, and she clearly still cares deeply for him. If she didn’t love him, she wouldn’t care enough to be so angry. My Memori heart is so happy. And I am now very excited and simultaneously worried about where their story takes them. But then, when am I ever not excited and simultaneously worried when it comes to this show? …I have nothing to say here, I just want us all to take a quick five hours to look at that screenshot and marvel at the wonder that is Mackson. ??? So Diyoza and McCreary used to bang. Cool cool cool. I liked how Diyoza interrupting the prisoner party paralleled Clarke doing exactly the same with a delinquent party in season 1. Sidenote, this show is very very good at a lot of things, but staging party scenes is not one of those things. McCreary’s tattooed back, all those crosses? Shaw being an altar boy? Diyoza setting up shop in the village church? They’re really hammering home something here. What is that mysterious asteroid sickness, anyway? ”All of me for all of us” is 100% a cannibalism thing, yes/yes? Seriously, where the hell is Niylah? She’s apparently not dead (thank god), but with all of Octavia’s “love is weakness” posturing, it is definitely not a coincidence that the person who might actually have sparked some love in her — and I’m not even being shippery, though obviously that would be amazing, it could be any form of love — is completely AWOL. Would anyone like a nice hot bowl of foreshadowing? I know others have already said this, but yeahhhh Cooper was totally mad about leaving those bodies behind because of their nutritious goodness. I will follow Octavia to the depths of her darkness. I love this storyline. But goddamnit, it is so frustrating (as I’m sure it is intended to be) to see Bellamy once again being her physical/emotional punching bag. I’m looking forward to seeing him and Clarke both rise up, individually and together, as active agents in this conflict (and it looks like that happens as soon as 5×06). Was it just me, or did it seem out of character for Echo to run through a likely hostile army to kiss her boyfriend? I understand that this moment happened entirely for Clarke and Octavia to witness it, and I’m not mad about it, but I’m crossing my fingers the show doesn’t lose sight of Echo’s actual character for the sake of a story about how torn Bellamy is between all the women he loves. Madi and Clarke’s reunion hug was so damn adorable. I’m glad they’re back together. Anyway, this season can pretend all it wants to be about battles and darkness and Chekhov’s cryo pods, but really, it is all about love. Every development, every decision, every reaction, is motivated by a love of something or someone. That is why this season is already so satisfying, and why it will ultimately delight and destroy us. There is a one-week break between this episode and the next one, meaning that The 100 5×06 “Exit Wounds” airs Tuesday, June 5. What did you think about ‘The 100’ 5×05, ‘Shifting Sands’?